Last week I wrote about beginnings, this week I want to talk about endings. Endings are very specific to each person’s own story so I can’t give individualized advice, but the most important thing is that endings must feel satisfying to the reader. ‘Satisfying’ is a very subjective word and it will mean something different to each reader. But here’s a good description: An ending is where tension is relieved because a conflict has come to a peak and everything has changed. The world will look different to the main character and reader now. Do I need a happy ending? Not necessarily. One of the defining factor of literary fiction is that there is no happy ending, where as with commercial fiction you must have a happy ending. Literary fiction readers come to expect the ending won’t be a perfectly happy one it just needs to be suitable for the story you’ve set out to tell. One literary fiction ending that was unhappy but stuck with me for a long time was Kiran Desai’s The Inheritance of Loss–haunting and unforgettable and quite sad, but suited the story. (If anyone has read it, they’ll know what I’m talking about.) The book wasn’t a happy one so the ending wasn’t either. However, with romance and other genres readers are expecting a happy ending. Know the tropes of the genre you’re writing in and sum it up with something the reader will enjoy. In a crime novel, we expect that the bad guy will get caught–don’t leave us hanging. How do I know when the book is done? Just like many writers don’t know how to start their novel, sometimes they write past their true ending. A great ending is done when all the loose ties are closed, but we’re left with a bit for the imagination. You don’t have to answer all the questions (like what happens to the heroine and hero after the ‘story’ is done) but you need to close off the conflict in a way that suits the story. It’s easy to fall in love with your characters and keep writing their story, but when it comes time to edit think about what sweeps everything in and when there’s a little left for the reader to think about–that’s the ending. Do I need an epilogue? Probably, not. Just like you rarely need a prologue. If you need an epilogue ask yourself if you told the story in the best way possible? Did you tie up loose ends before the book ended? If you want to write an epilogue that shows a ‘happily ever after’ or ‘where they are now’ I’d hold back. Leaving the reader with a hunger for more means you did your job. How do I create a ‘satisfying’ ending? 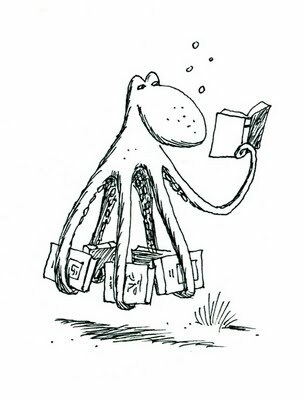 In the famous words of Anne Lamott in Bird by Bird: you have to get the octopus to bed. When you try to tuck one tentacle in another one ends up popping out. However, if you balance it all, it will go to sleep eventually. In other words, you have to make sure all the plot point and sub plot points are resolved. If you leave anything hanging the reader will know. A tight and somewhat conclusive ending makes you look like a pro and makes you look like you knew what you were doing all along. Q: How do you write endings? How do you know when your book is done? Found this post VERY insightful. Hadn’t delineated the endings vis a vis the type of fiction (except for romance, of course). Is there a specific ending expectation for upmarket fiction? Hi Kris! Upmarket fiction generally needs a happy ending. Upmarket fiction, to me, means a commercial plot with a literary quality to the writing. I really enjoyed this post! I’ve reached the point where I’d like to strangle the next author that leaves me with a cliffhanger ending. I’m all for book series, but I do believe a writer should offer the reader a tiny bit of closure at the end of book one. To be left dangling is unpleasant and lessens my desire to continue the series. I’m just finishing up book one of a series. The hard part is giving the reader a small sense of closure without it really being an ending. I finally opted for a climactic event that results in the capture of a secondary character, leaving the main characters injured but okay. The reader knows the story isn’t over. and will hopefully want to know what comes next. Kinda like a calm before the next storm. That’s a good point: small sense of closure. I used to be terrible at endings. However, I think that was because the rest of my story was not as strong and that I didn’t always write with the end in mind. As I matured and my writing matured, I discovered that when I had a solid story and my characters had a solid purpose, the ending came more naturally. The ending which I have in mind for my current novel is not in the least bit a happy one. But I do plan to have a follow up story after this one, which should hopefully wrap up the overall story a little more cheerfully. Great post, thanks! What took me so long to find your blog? Excellent advice, will probably spend my afternoon reading through everything. I absolutely loved the image of trying to contain an octopus! That image is stuck in my head with my sub-plot lines attached to each tentacle. Today, I learned an amazing new tool from you. I have recently acknowledged my aversion to ending my novel. After creating my “darlings” and molding their intriguing lives, I realized that I am avoiding closing their story. I will miss my characters – it feels like I am propelling them off into the wild blue where I will no longer be a part of their lives. I am a virgin novelist so I am hoping this fear will pass with experience. The image of the octopus (as silly as it sounds) helped me visually close the plot rather than the characters in my mind. Guess once I actually write the ending, I can mourn with a good bottle of Moscato and a bunch of chick flicks. I am new to this blog and will be hanging out from now on. Thank you for taking the time to educate us. It means a lot. That’s really interesting feedback. You’re too close to your characters to let them go. Yes, I am a wimp. I’ve enjoyed my characters’ experiences, as crazy as they were. They’re a couple of great gals who have taken on the world in ways I have not had to. I am pretty darned proud of them. I have a couple of other manuscripts that have wonderful characters too, but this is my first one close to being ready to submit. Maybe there is more of an overlapping worry that I have not done them justice and that they will not be as loved by others. It’s a new experience for me. I’m learning a lot about myself and crafting the art. Enjoying the ride!